Cholla Flower at Ethel M Chocolate Factory. Henderson, NV Click Cactus Garden for more images. While Supplies Last! The Garden is Blooming! The Cactus Garden at the Ethel M Chocolate Factory in Henderson Nevada. Beware of the hazards of the desert -- after trying their free chocolate samples, you might be convinced to part with some of your hard earned cash. The Cactus Garden is so easy to get to and it is so beautiful this time of year, I felt I had to mention it. The trails are wheelchair accessible. If you're lucky like I was you might see some humming birds and interesting lizards in addition to all of the beautiful cactus flowers. 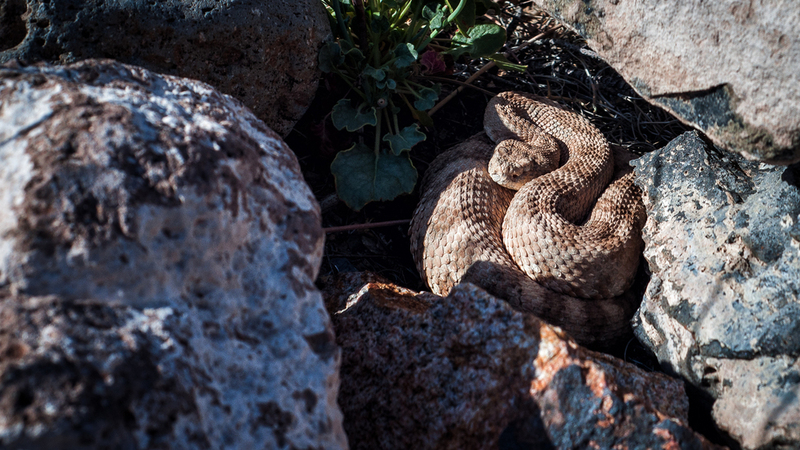 A sidewinder rattlesnake (Crotalus cerastes) found during a "clean up the desert" event in a pile of rocks. There's a Snake Under Every Rock! Don't Go Out There! I have since realized that to many people, nature is already pretty scary because it is a new experience and we tend to fear the unknown. To do what I did and add more terrifying phantoms to the wilderness is pretty irresponsible, not mention reckless and mean-spirited. I recently saw a picture that gave me the "willies" and reawakened an old phobia of mine. The picture featured some 30 or more rattlesnakes tangled together on a desert hillside. I used to be so afraid of rattlesnakes that I frequently had nightmares featuring these beasts. At first when I saw this post, I was just intrigued and awestruck because this scene allegedly occurred in our local Red Rock National Conservation Area, a popular place to hike, climb and otherwise experience the beauty of nature. Then I started seeing the same image over and over with conflicting information attached to it. The snake-pit picture was posted on three different Facebook friend’s walls. Two said it was taken in Red Rock Canyon near Las Vegas, NV and the other said it was taken in Oracle, AZ near Tucson. When I looked into it further I discovered the same picture claiming to have been taken in Matagorda Beach, TX, Canyon, TX and Riverton, UT. Hoax-slayer.com stated that this picture has probably been floating around since 2008 and has been claimed to have been taken in many different locations. Why is this picture representing so many different locations? Are there terrifying, writhing, hissing snarls of snakes all over the place? Why would someone lie about where the picture was taken? Are there nature guardians or protectors trying to discourage people from walking off the trail? Are there safety fanatics trying to protect naive explorers against the dangers of the desert? If you ask me, there is nothing more terrifying than the thought of stumbling into a pile of writhing rattlesnakes. I think that's why people post this type of image. Everyone has a reaction to it. It gets a lot of attention. It also makes us afraid when we go out into nature where we might encounter a rattlesnake. Another problem with this type of communication is that it helps to fire up the negative emotions associated with things that we fear, even to the point of hatred or violence. I can't tell you how many times I have been with people when a rattlesnake or tarantula are encountered and the first thing people want to do is kill them. Posting a picture like the snake-pit picture reminds me of the WWI posters put up designed to get people to hate "The Hun". It seems that our instinct is to kill what we fear. This leads to the death and destruction of significant numbers of animals that are just performing their natural function in the ecosystem, keeping a healthy balance of all kinds of living things that depend on each other for survival. Kill all the snakes and you end up with rodent infestations. Nature should be respected, admired, used for mutual benefit of all creatures, and it should be preserved for future generations. It should not be destroyed, even on a small scale, due to fear and ignorance. A small sidewinder under some debris in the desert near Las Vegas, NV. I am not saying that going out into a natural environment doesn't involve the risk of being injured. One should always be aware of what is going on. Don't step near a rattlesnake or put your hand near enough for a strike. We don't step in front of a moving car, just as we shouldn't mess around in front of a coiled rattlesnake. It's not personal and it's not evil or hostile in any way. Snakes like areas where they can do their thing and be protected from the elements and their enemies, for example, rocks, debris, under man made structures, etc.. Just be careful. I have had several close encounters with rattlesnakes over the years. I am always thankful that they rattle when they feel threatened. I appreciate them letting me know that I need to keep my distance. I no longer fear rattlesnakes and have come to enjoy seeing them in their natural habitat. I would hate to think of world with no more rattlesnakes because we killed them all. As usual be careful in the desert. Take plenty of water, watch your step and stay cool. Get out and enjoy nature! Don't be afraid, just be aware. To see the snake-pit picture I have been referring to you can visit the links below. I was not able to track down the original photographer or get to the bottom of where these pictures were really taken, but I doubt if they were in Red Rock National Conservation Area. Along the side of Mormon wells Road leading into the back country east of the Visitors Center.Click for photos. The desert asks us to see differently. To truly appreciate the desert we must zoom out for a wide angle view to take in the grand vista with all of its visible geology. Then we must zoom in close to look for and see the detail and beauty hidden within the minutia. Seeing becomes a creative experience where one looks at everything, big and small, with a new perspective. How does this common reed look, silhouetted against the deep blue sky? How does this tiny white flower look with a dark background from the shade of this nearby rock? Start using a few more senses and one can feel the warm breeze of approaching summer, flowing across one’s cheek, as the tiny brook tinkles faintly but distinctly in the foreground. Hear and see the wind rustling the reeds in unrehearsed dance steps taken by grass-skirted phantoms. The Desert National Wildlife Refuge near Corn Creek challenges us to discovery its hidden treasures. The brand new visitors center does a good job of showcasing the bounty of the area in one comfortable, air conditioned, mini natural history museum. The trails around the visitors center offer people easy access to the grounds of the Corn Creek Station and the raised hillocks created by old springs. Corn Creek is a great stopping off point on the way to Hidden Forest or a drive out in the wilderness up Mormon Wells Road into the Sheep Range. If you are lucky, you might see big horn sheep running across the old Alamo Road, a rattle snake in the rocks, a hawk or eagle soaring overhead, or a fantastic array of colorful wild flowers. The Corn Creek Visitors Center can be found a dozen miles north of Las Vegas, just east of highway 95 a few miles north of the Kyle Canyon turn off to Mt. Charleston. Get out and enjoy the desert! Joshua Tree, the signature tree for the Mojave Desert.